Savor your summer with a tasty combination of three of the season’s perennial pleasures in Fontana, Wisconsin. “Burnin’ Down the Docks” is a Sunday celebration of “Blues, Brews & BBQ” at The Abbey Resort, right on the picturesque Lake Geneva harbor. Promptly at noon, I heard the thump of live music kick in, attracting hungry boaters and resort guests to The Waterfront Restaurant dock like butterflies to bee balm. Soon I could smell the rich tang of Matthew Whiteford’s signature “layers of flavor” barbecue out on the traditional southern outdoor smoker. Sizzling baby back ribs, pulled pork sliders, and chicken wings are just $5 a plate, washed down with an icy Leinenkugel beer, priced right at $2 a pop. We sat at a table for six, and soon all of us were having a lively conversation. Matthew is an award-winning pit master champion on the BBQ circuit and now markets his own line of rubs, glazes, marinades, and sauces. I can personally vouch for them — I took some home with me along with a few of Matthew’s “low and slow” recipes and my pulled pork and short ribs get rave reviews. The Abbey Resort is located 80 miles from Chicago and 50 miles from Milwaukee, so area residents could drive up just for the day’s festivities. But I highly recommend making a long weekend of it. The Abbey Resort, spa, lake, pool, restaurants, and boutiques make for a spectacular getaway for couples and families. If you go for the long weekend, the surrounding area offers much to see and do, plus a fascinating history of millionaires and mobsters. 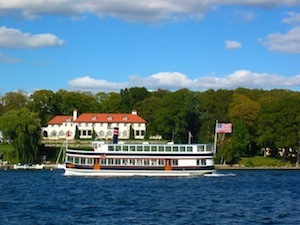 We got an excellent overview on one of the hour-long steamboat tours of Lake Geneva, the second largest lake in Wisconsin. I wanted ice cream, my husband wanted beer, and we both got our way on the Ice Cream Social Tour. 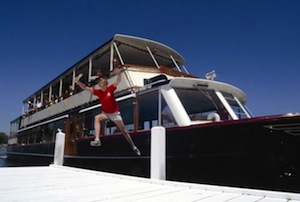 On the famous Mailbox Tour, a college student makes an athletic leap from boat to pier to deliver residents’ mail. The boat never stops, so the trick is to hop off and back on in time — to much applause. I really loved the dog who waits for the mail on the pier, takes it in his mouth, and delivers it up to the house. So where do the mobsters fit in? Once the automobile era replaced train travel, Lake Geneva’s fortunes declined and then became a haven for Al Capone and his friends. The tour guide did a great job of bringing the colorful history to life. As we floated past the magnificent summer homes, I imagined myself a dangerous gun moll or perhaps a racy getaway driver back in the day. For the power walkers out there, it is possible to walk completely around the 21-mile lake on The Lakeshore Path, a Native American footpath which connected the Indian camps. Chief Big Foot and his band of Potawatomi Indians called Lake Geneva the “land of the sparkling water,” and were the area’s original inhabitants. We were told they abruptly moved from this lake paradise to Kansas in 1836. Sounds like there’s more to that story.